I can think of five reasons why Cindy Sheehan’s protest against the Iraq war is succeeding where others, thousands of times bigger, were less successful. Her motives are impeccable. Her son was killed. She is grieving. She is particularly suffering because her son sacrificed his life without obvious benefit to his country. She cannot be discounted on political grounds. She can’t be dismissed as some radical peacenik. She is American as American Gothic. This is how the Viet Nam protest started. History is repeating itself. Even Bush knows it is only a matter of time until her growing protest succeeds. Powerful people get rich selling the provisions for war. A football game enthusiasm to go bash the hell out of some enemy. People including children, on both sides get maimed and killed. It diverts productivity to weaponry from livingry. It creates huge public debts. 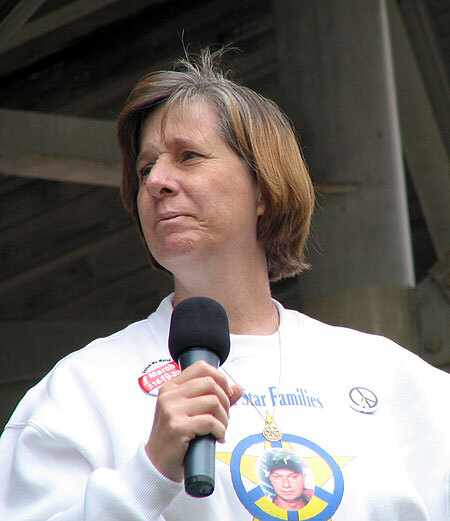 Cindy Sheehan with her hangdog face iconifies the main reason to avoid war — it is just too emotionally painful to lose loved ones in the fighting. She is not a statistic. She is a real mother with a real loss. War must be reserved for truly desperate situations where failure to act would kill even more. Sheehan asked a simple, respectful and completely reasonable question. She did not make a polarising demand. She asked a Where’s the beef? question that makes clear Bush has still not provided a plausible motive for the war. What did my son die for? is the fundamental question of any war. Bush has evaded it time and time again. Staying the course is not a reason for being on the course in the first place any more than it is a reason to persist in folly. Even pro-war people admit Sheehan deserves an answer to that primary question. Bush looks more and more cowardly each day by hiding from her.